Nurses Dana Foster, right, Ashley Banks, middle, and Kelly Wagner assess the healthy options for lunches and snacks at the MUSC cafeteria. The nurses who work the night shift at Medical University of South Carolina often complained to leadership that there weren't enough healthy food options in the cafeteria. For instance, Rachel Nusbaumer, a nurse for almost five years at the hospital, said the cafeteria only had cheeseburgers, fries or a few expensive salads. There also weren't any healthy snack options. “It's easy to eat poorly if you don't plan, especially if you're tired and busy. You're going to eat whatever to fill you up,” Nusbaumer said. To address this concern, MUSC decided to partner with the American Nurses Association on a pilot program focusing on nurse nutrition. The program is part of the American Nurses Association's Healthy Nurse, Healthy Nation initiative, which launched last year and aims to improve the health and well-being of U.S. nurses. The association found in a 2016 survey of more than 14,000 registered nurses that they aren't as healthy as the general population. For instance, only 16% of nurses ate the recommended serving of fruits and vegetables and the average body mass index was 27.6, which is technically overweight. As part of the initiative, ANA partnered with hospitality company Sodexo to work with hospitals to improve healthy food options in their cafeterias. MUSC was the first hospital to work with Sodexo on a pilot project, which started in June and ended last month. The ANA started by surveying the nurses to understand their main wellness and health issues and found many struggled to eat healthy. Taking those results, the ANA then worked with the Sodexo chef at MUSC to provide more vegetable and fruit options in the cafeteria. The new options are a variety of different wraps and salads including a Korean tofu noodle salad and a Greek salad. Additionally, new snacks were made available like cups of strawberries, celery sticks with ranch dressing, and a boiled egg with almonds. The foods, which are made every day, are packaged so nurses can take them to go. The labels on the food also indicate how many servings of fruits or vegetables each option contains. 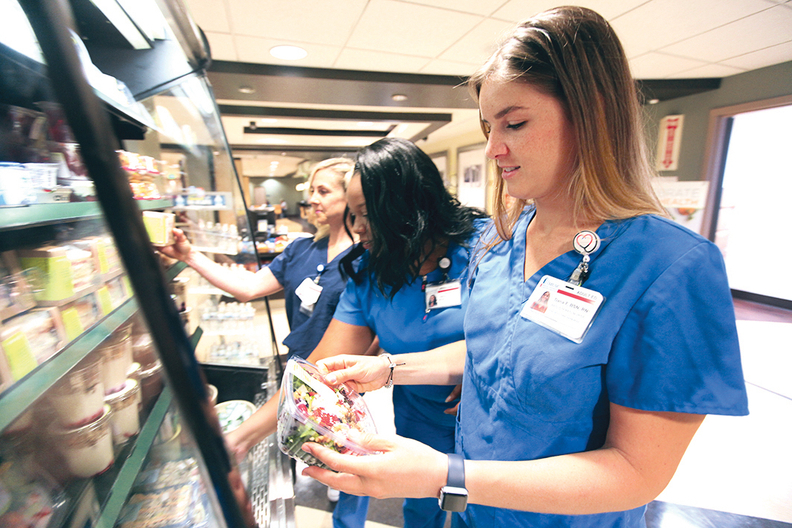 “They are available for pickup, so it helps the nurse who can come in and make a quick and healthy choice and be able to leave the cafeteria in short order,” said Julie Branham, national nutrition director for Sodexo's North America hospitals segment. MUSC leadership promoted the new food options to its nursing staff through announcements at morning huddles, newsletters and on computer screensavers. Nurses make up more than one-third of MUSC's workforce. Creating a healthy environment for them—more than 2,000 in total—is a big part of the hospitals strategic plan, said Andrea Coyle, professional excellence and magnet program director at MUSC. “If we keep our nurses healthy it will have a huge return on investment,” she said. The hospital is engaging in other activities that address nurse wellness, including providing healthier options in the vending machines. The feedback from nurses on the pilot were positive, Coyle said. She received many emails from nurses—especially those working the night shift—praising the new options. “The nurses love it, they were just so excited,” she said. Nusbaumer said she likes the new options not only because they are healthier but because they are affordable too. Even though the pilot ended, Sodexo will continue to provide the new menu items in the cafeteria, Branham said. The ANA is planning more pilots, including one this fall with CarolinaEast Health System in New Bern, N.C.